this set of the requests is passed to the invoker. Invoker is providing communication with the SUT and returning responses. Responses are verified by validators to take pass/fail decision and processed by metrics to collect some measurements. During the run time every virtual user is working with it's own invoker, thus allowing to generate load. To create your first load test using http, you need to create an endpoint provider, like in the example below. 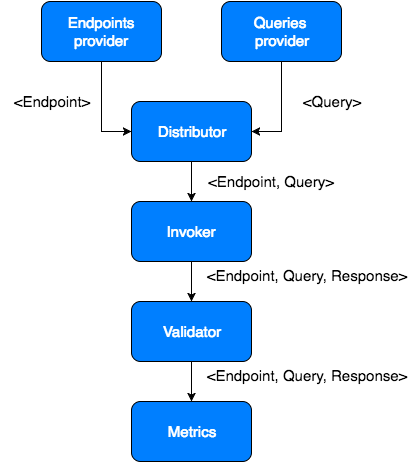 create test data sources - providers of your endpoints and queries. Providers are implementing Iterable like in the examples above. // For standard metrics use JMetricName. // JLimitVsRefValue is used to compare the results with the referenced value. // the threshold is relative. // JLimitVsBaseline is used to compare the results with the baseline. // Use 'chassis.engine.e1.reporting.session.comparison.baseline.session.id' to set baseline. // JMetricName.PERF_LATENCY_PERCENTILE is used to set limits for latency percentile metrics.